Life is good, if you choose to look at it that way, but we can’t deny that the challenges we are often faced with, are difficult and exhausting. There is no way that anyone on this planet gets away with life floating around on a cloud of perfection, I haven’t met anyone that is, not yet anyway. What would be the point of coming to this crazy and messed up planet if your Soul didn’t have an agenda to evolve, you might as well have picked another place in the cosmos instead, somewhere much more peaceful and less dysfunctional than Earth. But we are here and so it is up to us to make the best of it. Getting to the Soul Work of our existence is what we are expected to do while we are here. We set out those expectations for ourself before we came here, so there isn’t anyone you can blame for how your life has turned out this far, but yourself. Every choice, every decision, everything that has happened to you up until now, has been your responsibility, either by your predestined fate or your free will. So what if I tell you, that where you are right now, in this very moment is exactly where you are supposed to be. Where you will be later today, tomorrow or next week is entirely up to you, you have full personal power to alter your life at any given moment. The only decision you have to make to change the way you are living your life, is whether you will continue to listen to your Ego or will you trust your Soul from now on. 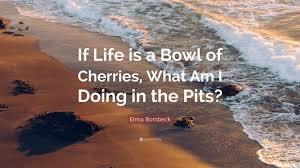 Life is indeed a bowl of cherries (whether you like cherries or not) because it doesn’t have to be as difficult as we make it. Everything you need to make your life into everything you have dreamed about, is inside of you in your inner tool box of magic. You were born with an intuition, no one is exempt from receiving this gift when they come into this reincarnated life experience. Your job is to find out where in you it lives, how to use it, and when to trust it. Once you recognize how truly useful your intuition is you will laugh at yourself for being so scared of it for so long. If your life isn’t everything you had hoped it would be, if you feel like you are in a slump of unhappiness, if you are in a funk that you just can’t seem to shake or if you know there is something you are meant to be doing (other than what you are doing) but you just don’t know what it is, then you have disconnected yourself from the one thing that can help you more than anything,with any of your problems, and that is your intuition. Tap out of your Ego, and tap into your intuitive nature, it will only be as difficult as you make it. I say make it easy, make that your new mantra and see where you go from here.